My changing bag however is a different story. You have to pack EVERYTHING as you never know what the day will hold with a 15 month old boy. Apart from the obvious (spare clothes – you can NEVER pack too many vests #poonarmi, nappy sacks, H20, a beloved dummy and not forgetting snacks – Organix Goodies are our current favourite.) I thought i’d share a few of my changing bag essentials with you (FYI a post about our collection of changing bags is a future blog post #watchthisspace). 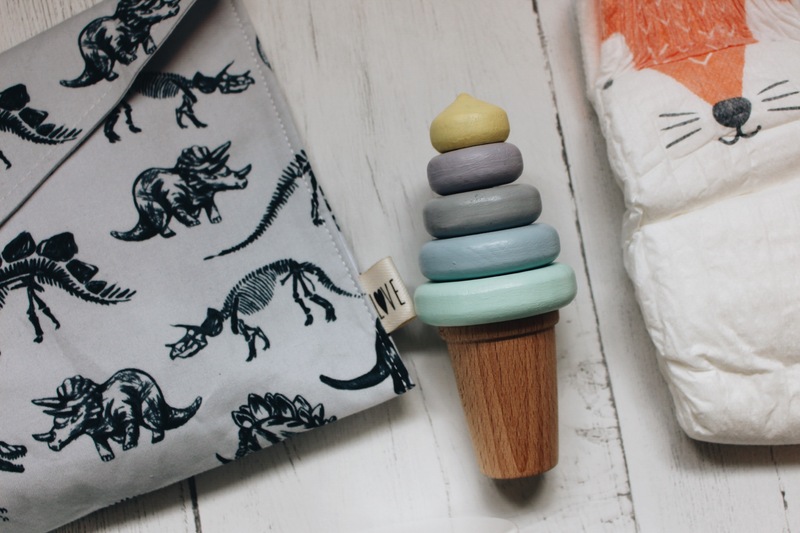 First up is our ‘Roarsome’ dinosaur print nappy clutch from Love Roo. This oh so lovely clutch is made from 100% cotton and will fit 1 pack of baby wipes (we love Aldi’s Mamia sensitive wipes) and 3-4 nappies depending on nappy size. 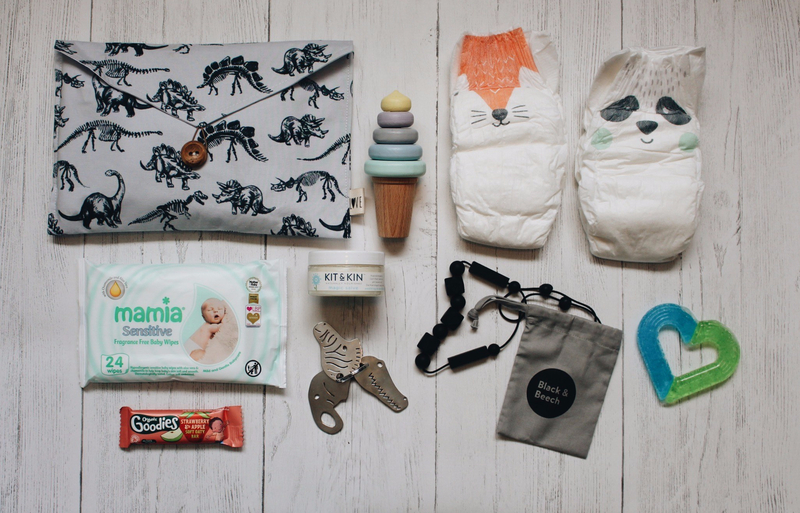 A while back I blogged about Kit & Kin‘s eco-friendly nappies (read the post here). We LOVE LOVE LOVE them! They are available with a bear, fox, panda or tiger print on the bottom. Sebastian wears a size 5 nappy, they fit perfectly and so far there’s been no leaks! Even after a full 8 hours sleep! 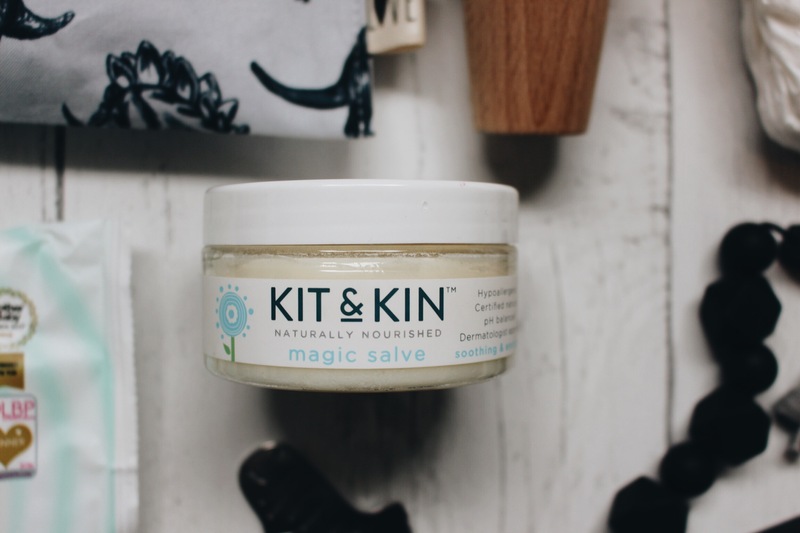 Sebastian’s peachy derriere is kept smooth with Kit & Kin’s ‘Magic Salve. This creamy salve moisturises, calms and protects delicate skin from further irritation such as nappy rash or dry spots. This tiny pot is the perfect size for any changing bag. Sebastian is forever teething. There’s a never ending amount of drool! Most of the time he wants to sink his tiny teeth into something… usually my shoulder or is beloved Elmo teddy. Munchkin‘s ice heart teether has gel that can be cooled in the fridge which helps to soothe Sebastian’s gums and the multiple ridges allow him to hold it himself and happily chomp away. 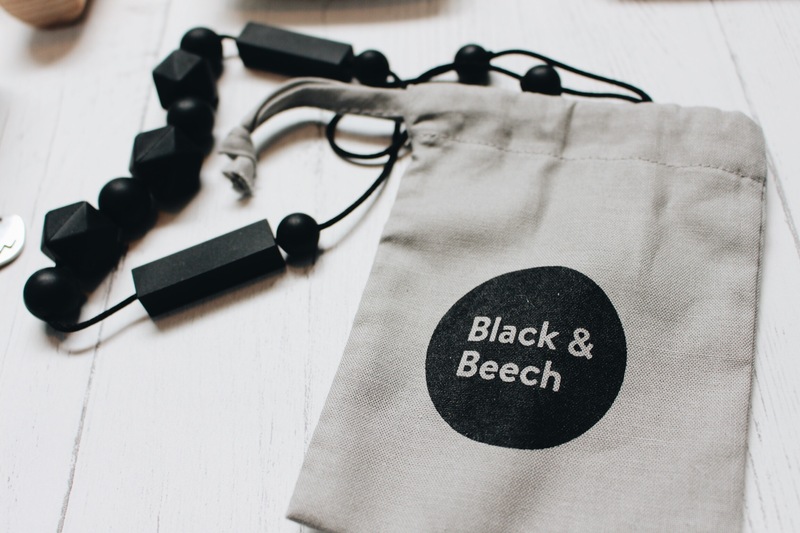 As the ice heart teether gives him more relief when it is cold, I wear the ‘Albert’ teething necklace from Black and Beech for the rest of the time which he loves to sink his teeth into plus I look frickin’ cool wearing it! ….And finally you need to ensure you have packed something to distract him when he’s having a melt down in a coffee shop and your beloved flat white is getting cold!! I whip out this CUTE wooden ice cream stacker from Happy Little Folks… consisting of 6 elements (5 rings, pole with a cone) this stacker can keep Sebastian occupied for a good 10 minutes! Enough time to drink that coffee! I also pack a set of Yummikeys (which are also good for tiny milk teeth and sore gums). 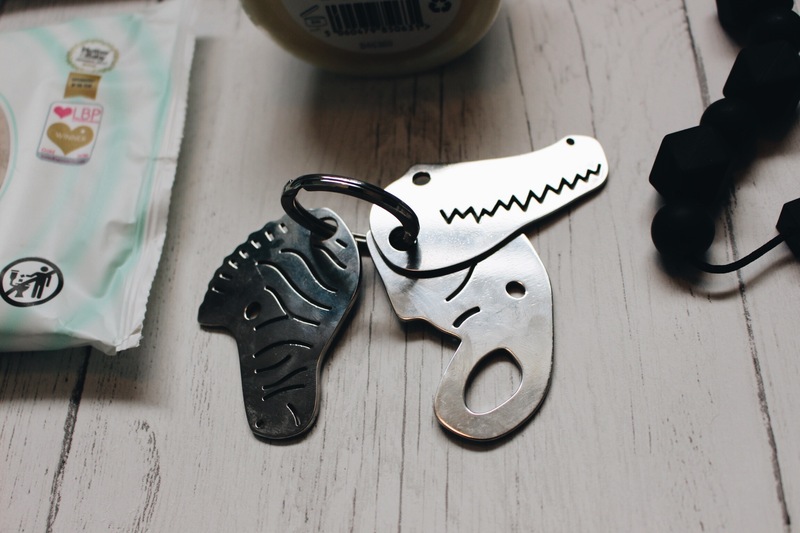 Featuring Coco Crocodile, Ziggy Zebra and Emma Elephant they are made from stainless steel (the very same material as your cutlery). Sebastian LOVES to bash everything in sight with them (saves my car keys getting launched into the air) and again keeping him occupied for 600 seconds! So there we have it! A few ‘changing bag essentials’. #watchthisspace for my changing bag reviews! Items from Black and Beech, Yummikeys and Munchkin were kindly gifted to Sebastian for this review. Thoughts, opinions and photos are my own. Such a lovely post! 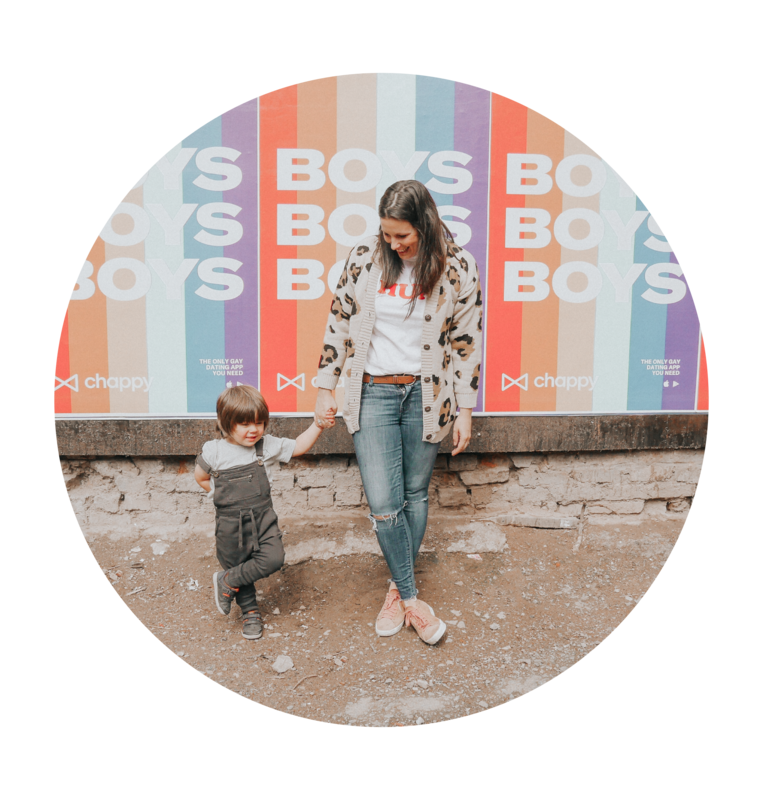 Thanks for sharing and showcasing some great instagram shops to check out!